Aquaman, but both have me hyped. Aquaman’s was incredible. But Shazam’s was good too! Better than what I was expecting. I really liked Shazam but that Aquaman trailer though. Shazam looks cool & funny. Leaning slightly toward Shazam. It does look better than what I expected. Aquaman, but the Shazam trailer made hyped for a movie I previously had no interest in. I could see it being a big hit with the family audience. I have to remember that one was a teaser and the other a trailer, but the Shazam one was a lot better than I was expecting and I was already really looking forward to both these movies. Aquaman a little more so since I'm more familiar with him and his stories. I’m glad that their movies are so comic accurate. Aquaman. Shazam looks incredibly underwhelming (sad, because he's my second favorite hero). Shazam, but they're both pretty awful. Both underwhelming but Shazam. Aquaman color palette way too bright. Atlantis is suppose to be deep under water hidden city but why is so freaking bright? Cgi seems low grade prob due to budget limitations which is fine, but with the scope Wan is trying to tell, it prob needed a bigger budget to begin with. Anyway Shazam looks better to me because being a low scale children's comedy fits within its framework. Totally different vibes from both the trailers so it's difficult to judge. Aquaman trailer is much more grand and visually stunning so I'll choose that. Shazam was good too but I felt like it lacked some high octane action. Shazam appears to be a more enjoyable movie, while Aquaman trailer looks visually appealing however the story look like some generic chosen one quest sh*t but this time underwater. Shazam looks awful. I mean bad. Like it's a tv series or something. What are people looking at? Aquaman looks like it could be one of the best looking films in years. I find the suit distracting in Shazam. Aquaman looks like it could be really fun, though. Less "My man!" than JL which is a good thing. 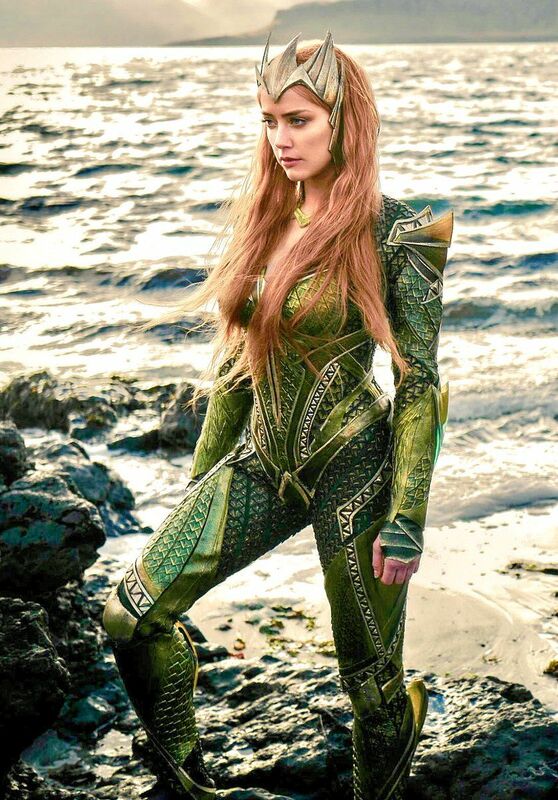 My only real complaint is that Mera's hair is too red. It's cartoonishly red, clown red I would say. In the trailer, she tells Arthur that he is the child of a lighthouse-man and a queen. While I don't know her mother, I have a good idea who her father was. I would have preferred something brighter than JL-Mera, but less intense than Aquaman (2018) Mera, however I concede that James Wan might have chosen that color red because it retained its vibrancy when diluted underwater. It's a nitpick for an otherwise impressive trailer. Besides the suit, the other problem I have with the Shazam trailer is that I don't buy that Asher Angel (Billy Batson) is Zachary Levi, the superpowered "Big" version. Admittedly, it is very little to go on, but if where just talking about the trailer, the mannerisms and personality of the two actors don't seem to be the same. Angel is way too "preteens have posters of them on their walls" cool. I heard someone say on another website that they thought Jack Dylan Grazer (Freddy Freeman) should have that role, and I tend to agree. I'll see Shazam, but I don't have high expectations, and perhaps that's a good thing. Aquaman IMO. I didn't like what I saw of the Shazam! trailer, but then again I have never read a comic with the guy in it. Both were good but I would go with Aquaman personally. Both look like generic reactions to already successful Marvel & Fox CBM's. I like them both a LOT, but I'm just digging the hell out of Shazam. Aquaman for me. I don't like the suit. Zachary Levi face already looks lack of seriousness and then the suit with glowing lightning bolt and bright red color make him look like a parody. But the film is still in early development so I hope that they made the suit rust red like Deadpool, Ant-man or Wonder Woman. Shazam is straight trash and Aquaman is ehh. I say Aquaman because of the sheer scale of it. I actually liked them both, but Aquaman has me more hyped with that Black Manta outfit.